A computer dance programme has succeeded in getting even young people who hate sport to take exercise. 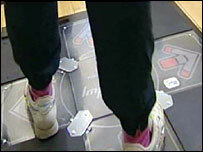 Dance Revolution involves laying out removable mats in a studio, and getting participants to follow instructions from a computer on a large screen. Each mat transmits how well each pupil is doing and the results are flashed up on the screen. The classes are being targeted at girls in Bedfordshire who do are not interested in traditional sports. Daniel Gill, of Active Luton, the trust which runs local sports and leisure facilities, said: "You tend to burn about 400 to 600 calories an hour in these classes. "You are working on coordination, balance, cardio vascular, stamina. "You can vary and change the intensity so it matches other sports quite well. "There is no segregation on ability. Even if they know they cant do all of it, they can try anyway. And it's a good way of introducing them to a gym." Mellone Cutts is the head of PE at Lea Manor High School which took part in the trials. "There is a number of students who we don't reach with competitive sports," she said. "With more and more children becoming obese, one way we can help is by increasing participation in sport and this does that." Each class lasts for 45 minutes and the programme allows you to choose from five levels of difficulty. The software provides aerobic and interval training programmes, and the classes can also be structured to include a competitive element. Isha Patel and Elisha Chohan, both 14, took part in the trials. Isha said before the dance mat classes she didn't like PE. "I don't like running around a lot and it's just the thought of all that stuff. "First of all I didn't really want to do it, but then everyone's, like, "it's going to be really good" so I thought I'd try. "Now I go to dance mat once a week and I also go to the gym." Elisha is also a fan: "I think that it keeps you really fit and it's something you can enjoy with your friends. "If you make a mistake, no-one notices because they are doing their own thing and you can catch up. It is hard work but lots of fun." The trial classes proved so popular that they have now been opened up to all pupils as part of Lea Manor's sports curriculum and as an after school activity. The Dance Revolution studio is also being made available to all of Luton's senior schools for them to use as well and Active Luton has just started putting on classes for members of the public. Daniel Gill said: "This is not just for kids, adults use it as well. In the public sessions we have been getting whole families coming in. "The kids, their sister, their brother, their mother. There's no generation gap. "How many sports out there can you think of that work for the whole family?"